Report: convoy with Hezbollah flags fire in the air near Metula during funeral for jihadists killed in IAF airstrike. 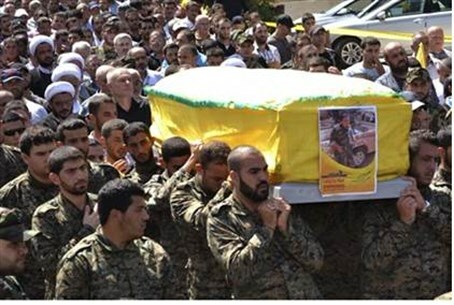 Hezbollah convoys participating in the funeral of jihadists killed in an alleged Israeli airstrike on Syria have fired shots in the air near the border, close to Metula, international news agencies report Tuesday afternoon. Civilian vehicles with Hezbollah flags were spotted in the border town of Al-Hiyaam; the terrorists inside fired in the air as they neared the border. On Sunday, Hezbollah commander Jihad Mughniyeh was killed in an airstrike in the Syrian Golan allegedly carried out by Israel. Israeli intelligence sources revealed Monday that he was the head of a "broad and deep" Iranian-sponsored terrorist network. It is suspected that Mughniyeh was planning serious attacks against Israel, including rocket attacks, infiltrations, and using explosives and anti-tank missiles. The strike also killed six Iranian solders and commanders, including an Iranian general. An Israeli security source confirmed that an Israeli helicopter had carried out a strike against terrorists in the Golan who were allegedly planning an attack.